Muncie Power Products, Inc. showcases its most recent, innovative line of high performance gear pumps/motors, the Optimum Series. Muncie Power’s Optimum Series is designed for durability, featuring a rigid pump design for long product life and maintained performance. Available in three frame sizes (W, X and Y) and tandem or triple configurations, the Optimum Series possesses flow ranges from 6-63 GPM at 1000 RPM and pressures of up to 4350 PSI. With its patented OPTI-Grip® technology, the Optimum Series gear pumps/motors resist casting separation through greater structural integrity. The Optimum’s full featured design allows for reduced inventory requirements and installation flexibility in a cost competitive package. In addition to a full featured design, the Optimum Series also features a 13 tooth gear design that provides smoother operation and reduces hydraulic noise. 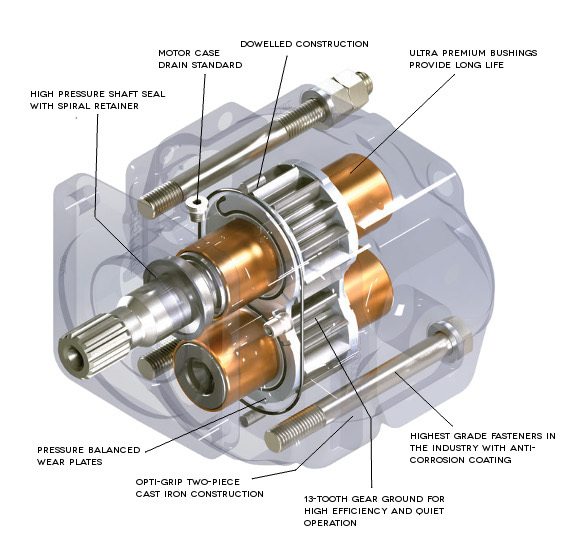 For more information about the Optimum Series gear pumps/motors or to request Muncie Power’s Optimum Literature Kit, including pump specs and details for all three series and a sliding calculator for horsepower, torque, pump flow and cylinder calculations, please click here. If you would like more information or to place an order, please contact customer service at 1-800-367-7867.